Almost everyone I know, including myself, have had some kind of event that has thrown us off track, hopefully temporarily. It’s not always easy to resume, like pushing the button on speed control. There are many reasons why it’s so difficult to regroup ones energy, purpose and drive to continue. We can feel emotionally and physically drained, fuel tank on empty and no immediate relief in view. These life events range from the death of a loved one, a serious illness of a family member or ones self, and less major occurrences that can include being disabled, laid low for awhile with a health issue and even something like losing a job or being rejected repeatedly while trying to get an application or a manuscript accepted or just changing jobs from one track to another. A neighbor down the street recently had his leg amputated, at first just above the knee and then all the way to his hip. His attitude appears to be I’m still alive and I intend to make the most of what I have left while I can. He has made great progress on a walker, has been fitted with a prosthesis and he drives his truck with his left leg. He is definitely getting back on track, maybe not with the same speed or ability but he is a great example of doing the best he can with what he has where he is. A number of people who seem to lose a sense of purpose and the desire to continue have a hard time convincing themselves that the effort and energy required would be worthwhile and that it would be easier to just give up, give in and throw in the towel. The truth is that it would be easier. The encouragement and support of friends and family are well-intended, maybe even helpful sometimes, but they either don’t understand or if they do, their answers are what they would do, and those may or may not work for you. It may be that we need to step back and “recalibrate,” a term I learned from an Intel employee who often used the term when she meant that we needed to have another look and see if our assessments were accurate and on track. Her experience from another industry helped us on numerous occasions to take another, different approach. It fits the “on track” metaphor because trains run on tracks that are definitely calibrated and recalibrated frequently. 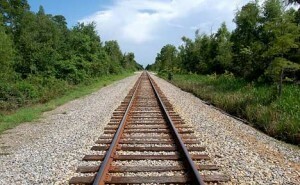 In the U.S. most tracks are exactly 4 ft 8 1⁄2 in or 1,435 mm. When I worked on the railroad, we spent a lot of time lining tracks and making sure they were the exact, correct width. Now machines do that job. So, what can we do to get back on track besides realigning the road ahead? · Take time and don’t rush it. Step back and evaluate your choices. · Make sure you’re doing what you can for yourself physically, mentally, emotionally and spiritually, meeting those needs for good health. · Talk to someone who might understand and appreciate your challenges and perceived obstacles. · Start with building a simple step-by-step plan and adjust it as needed. Take baby steps. It’s the way to move forward. · Engage and connect. We are social beings and isolation sometimes delays getting back on track. However, there is also value in spending some time alone gathering your resources. · Rediscover a new purpose or explore something entirely different. Consider giving some time as a volunteer. · Realize that each day is a gift and what you make of it is up to you. · Check in on your “attitude of gratitude” and how you might appreciate what you have in a different way. · Read, listen, watch and pay attention. There are clues out there. · Be KIND to yourself. There is no magic formula or recipe that works for everyone. Each person has his or her own unique personality and figuring out what is going to work best for you is a process, not flip the switch and instantly be on a different track. And remember, breathe deeply while you consider the road ahead.